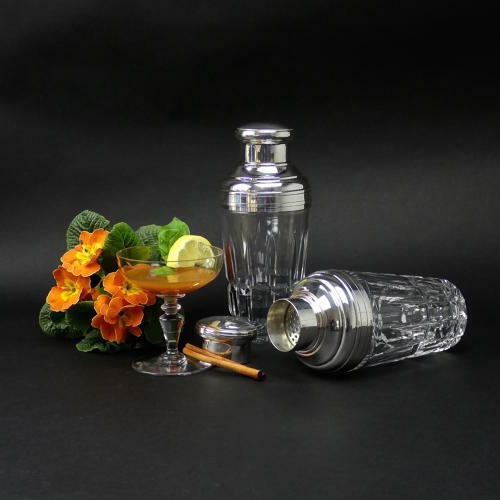 Price includes shipping within the U.K., Western Europe and the U.S.A.
An exceptional pair of St Louis crystal cocktail shakers with silver mounts and lids. These date from the 1920's when cocktails first became popular. The glass bodies have a very deep, angular, cut design and one is marked, to the base, 'CRISTAL ST LOUIS'. The covers have an integral strainer and these covers bear a French silver hallmark. These are very stylish as well as being practical. There is a very tiny chip to the glass on the base of one but other than this they are in excellent condition.